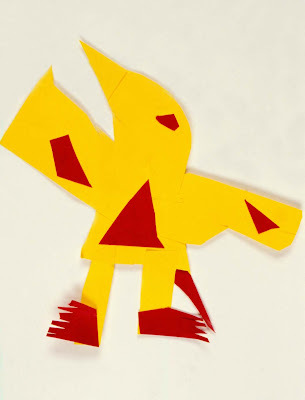 The children make cut-paper birds for a group mural and then draw pictures of their birds for a booklet to identify each artist. For ages 3 to 6. Plan 2 sessions. Cut a large tree from construction paper and attach it to the wall with adhesive putty. Set out scissors, glue, construction paper, dampened sponges, and optional scrap paper bin. Explain to the children that they will be working together to make a mural which is a large display attached to a wall. 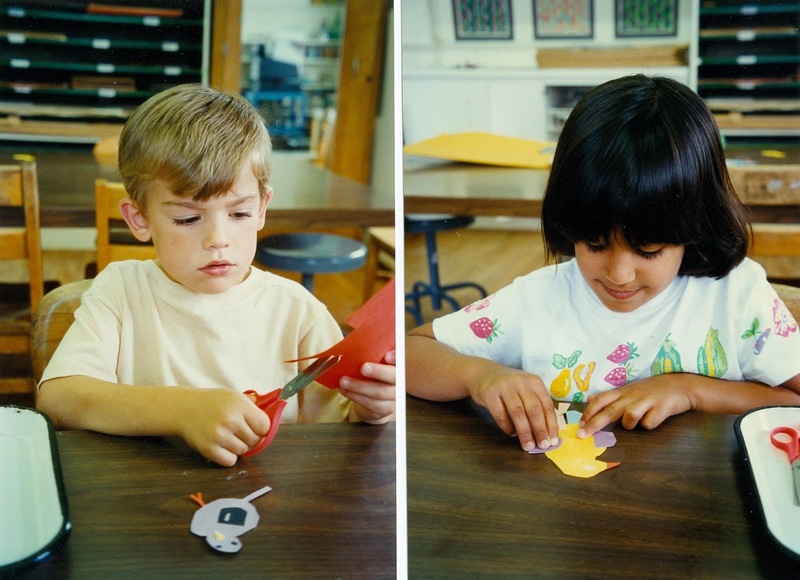 In this session they will be using paper and glue to make birds to place on the paper tree on the wall. 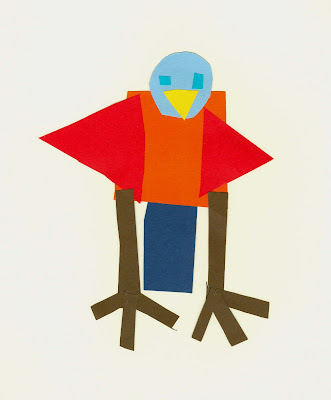 While looking at the pictures of the birds, discuss their shapes and how they have very little neck definition. Point out the variety of tails and beaks, the round eyes, and the array of colors. Notice that when birds are standing, their wings are at their sides and the claw-like talons used to grasp the tree branches are visible. Show the children how to attach two pieces of paper with glue by applying glue to the smaller paper and pressing it on to the larger paper. Warn the children that it doesn’t take much glue to attach the pieces. Use the dampened sponges to wipe sticky fingers. Explain that the birds need to be large enough to be seen on the tree, but not too large to sit on the branches. 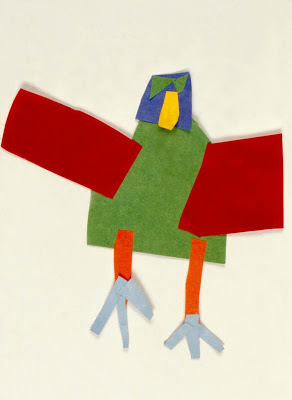 Have the children cut and glue their paper birds. Set out dried paper birds. Set out black permanent markers, colored watercolor markers, and drawing paper. Have available, but set aside, adhesive putty to give to the children as they attach their birds to the tree. 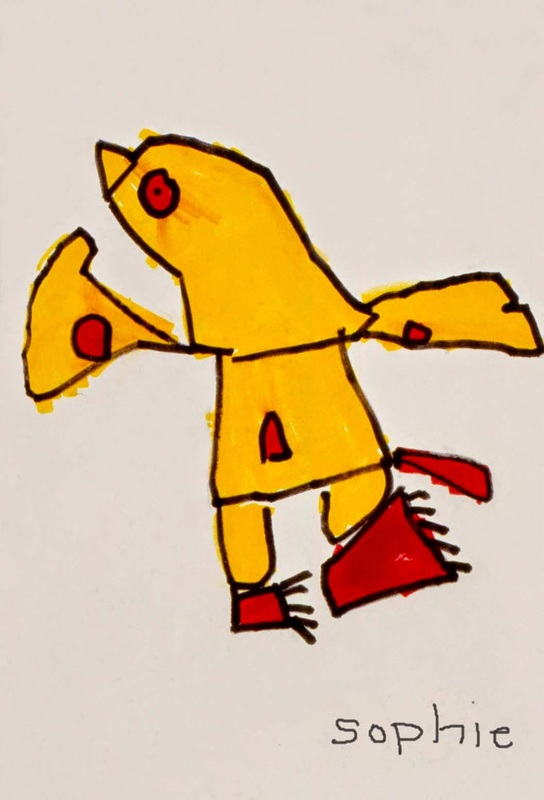 Tell the children that they will be working together to decide the placement of the birds on the tree and then they will be drawing pictures of their birds for a booklet to be used to identify the artists. Explain that each child will take a turn choosing the placement of his/her bird on the tree. While holding the bird up to the tree, have the children discuss whether the chosen placement creates a pleasing or balanced effect. For example, two birds of the same color will stand out better if separated from each other and large birds will appear more unique next to smaller birds. When a location is decided, give the child a small piece of putty adhesive to attach the bird. Repeat this process until all the birds are placed on the tree. When the mural is completed, give the children drawing paper and black markers to draw their birds for the booklet. 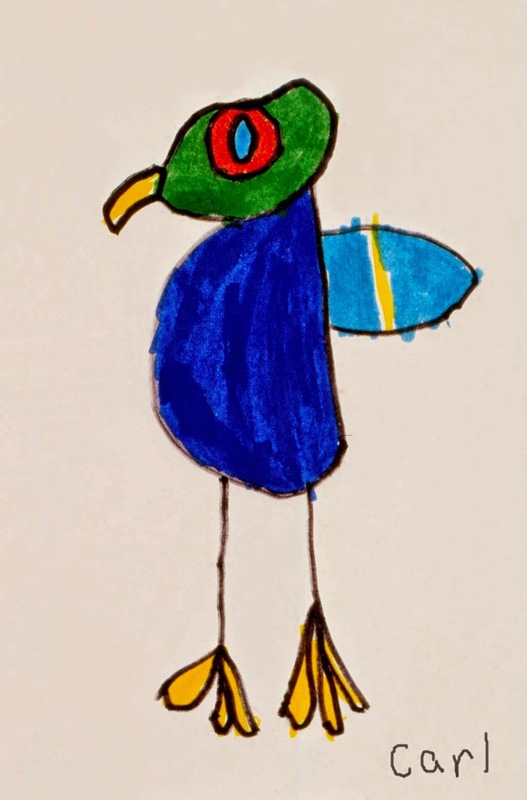 Have the children color the birds with watercolor markers, duplicating the birds as much as possible. Be sure that the children write their names on the bottom of their drawings. Explain that these drawings will be displayed in a booklet near the mural so that observers can identify the artist of each bird. Note: Make the booklet by punching a hole in each drawing and holding them together with ribbon, string, or a metal ring. Be sure the booklet is easy to open because it will be very popular with observers. The tree in the photo above was made by an adult. For a less formal look, you can have each child contribute a branch for the tree. Be sure to keep the tree simple so the birds will stand out. Very small pieces of the adhesive putty actually work better than larger pieces to attach and hold the birds on the tree. 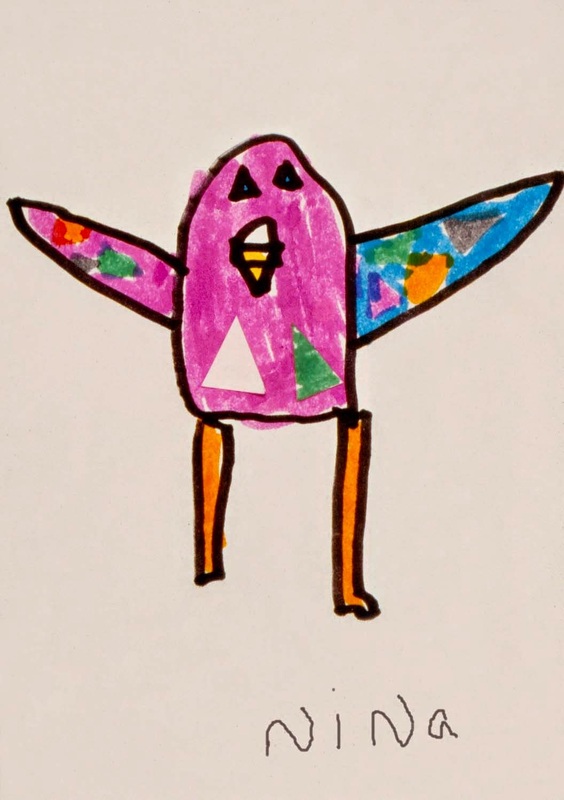 If you have the children draw the pictures of their birds before putting them on the tree, be sure that they understand to not use the markers on the cut-paper birds. This project will work well on a bulletin board, however it is especially effective when presented on the wall. Are the various parts of the birds carefully glued together? Are the colors and sizes of the birds scattered in a pleasing and balanced manner throughout the tree? 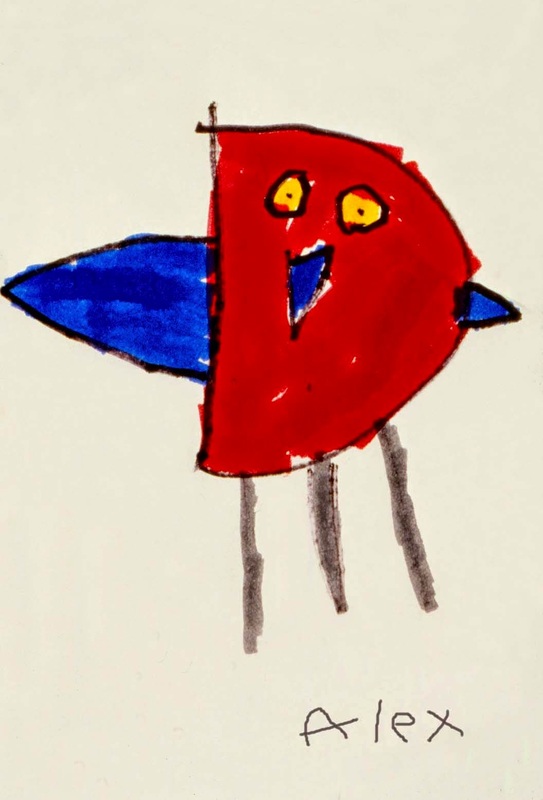 Can the paper birds be identified by their drawings? These scissors don’t work. They won’t cut the paper. I can’t find a marker to match the color of my bird’s wings. I want my red bird to sit next to my friend’s red bird. Uh oh! I made my bird flying instead of standing. If your fingers are sticky, wipe them on the dampened sponge. The colors of markers that are closest to the colors in your bird will work well. 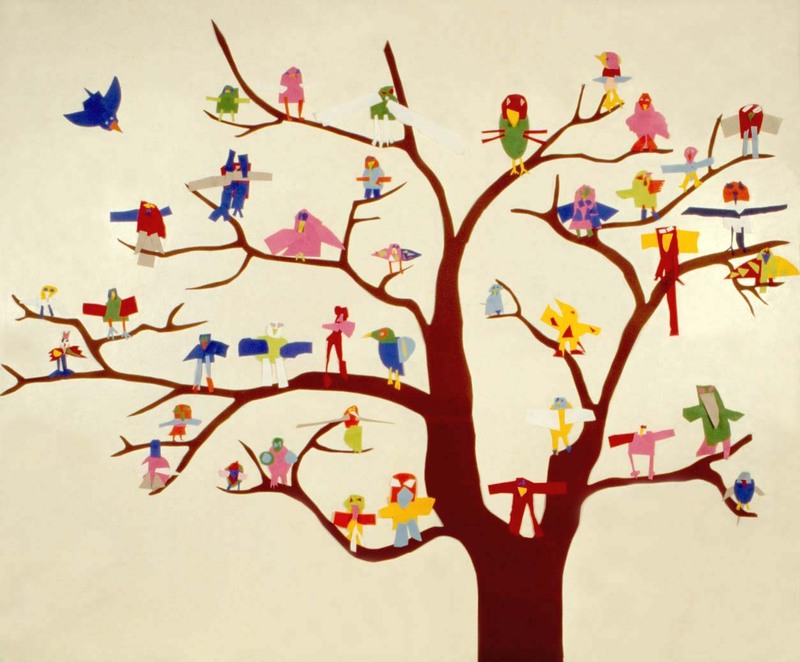 You and your friend can make the group mural brighter and more pleasing by scattering the red birds around the tree. Let's put your bird flying towards a branch, getting ready to land.